Well, it's about time. Google+ hasn't had a big update in a while, it seems. 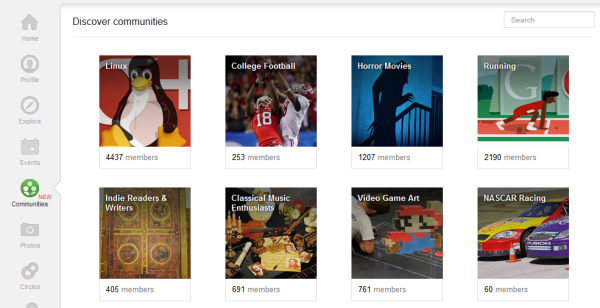 Earlier this week, Google+ rolled out its latest new feature thingy -- Google+ Communities. I'll explain what they are and how to set them up in detail in this blog post, but the long and the short of it is they're little online communities on Google+ ... pretty much what the name implies. Think of it like your LinkedIn or Facebook Groups! But, you know, on Google+. Alright, without further ado, here's your introduction to Google+ Communities if you'd like to dabble in the latest and greatest of social networking! Finding conversations about a particular topic so you can participate in the discussion -- like people interested in talking about John Donne's poetry, for instance. Starting Hangouts and planning events with community members -- hey, your Marlowe book clubs have to start somewhere. 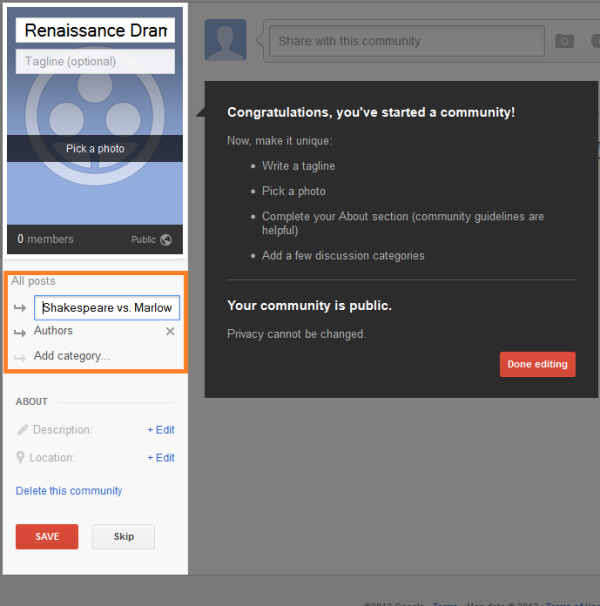 Sharing your community via +1 buttons -- if you want more people to share the Shakespearean love, you bet your +1 buttons you'll want to use this feature. So, what's the use case for marketers? Ohhhh, let's say you own or do marketing for a local bookstore. That just happens to specialize in antique books. It might behoove you to network with other people that are really into that ... because they might just become a customer, or know someone who will. 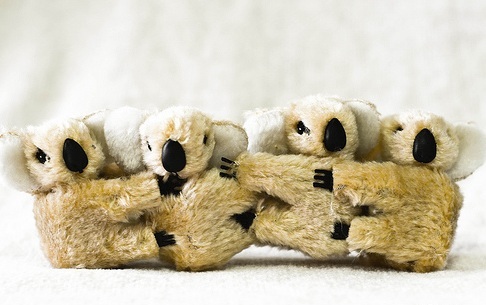 Just like you'd do some digital networking on Twitter, Facebook, LinkedIn, and other online forums, you'd probably want to either find the Google+ Communities where these people hang out ... or create them yourself! Pretty straightforward stuff, right? Thought so. So if you're sold on the value of this sort of online networking, you might be wondering how you actually do it with Google+ Communities. I'm so glad you asked! 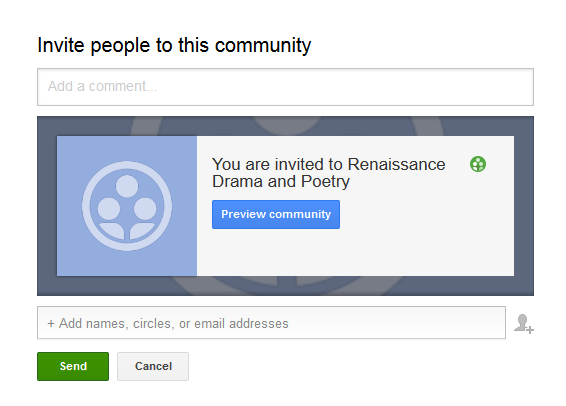 You can access Google+ Communities by clicking on the "Communities" icon when you're in Google+. To create your own community, just click the red 'Create a Community' button. 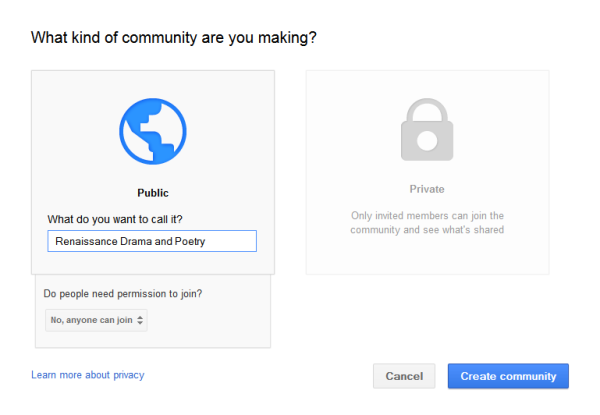 Once you click the 'Create a Community' button, you'll be asked whether you want to create a public or private community. I'd recommend choosing a public community if you're doing this for marketing purposes, so your reach is wider. Once you make your selection, you'll insert the name of your community, and select permissions settings -- I selected that nobody should need permission to join, because marketers would typically want to remove barriers to entry if they're trying to grow a community with wide reach. Next, you'll be prompted to fill out your Community's profile information -- this is all pretty typical stuff, like your photo, a tagline for your group, and a brief 'About' section where Google recommends you lay out some guidelines for the community. But the most important part in my opinion is starting a discussion category! That way, people have a reason to come to your group and engage in lively discussion! I've outlined in orange in the image below the place where you can add some discussion categories. Once you hit 'Save' on this screen, you'll be prompted to invite people to join your group. As you can see, you can invite people via names, Circles, and email addresses. Once you hit 'Send,' get ready to celebrate ... because you're done! You just created your first Google+ Community. Well done. For good measure, I'd like to show you how to search for Google+ Communities, too, since you'll probably want to be an active member of other people's Communities. Just go back to the 'Communities' icon on your left navigation, and you'll find any Communities you've started, as well as a list of other ones available -- and a Search box to find others by keyword. Easy, right? Now go get networking!